Paulina Gadamska-Kabata, a M.D. from the Department of Haematology & Transplantology, Katarzyna Gruchała, a Ph. D. student from the Department of Medical and Pharmacy Law, Ewa Orłowska, MUG graduate, prof. Michał Chmielewski, M.D., Ph. D., from the Department of Nephrology, Transplantology and Internal Diseases and Damian Szczesny, Ph. D., associated with Tri-City Academic Laboratory Animal Centre – Research and Services Centre and Department of Biopharmacy and Pharmacodynamics took part in the “Race for the Cure – Olga Gajdus Memorial”. 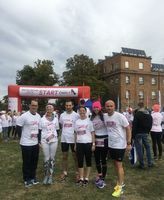 Event which took place on September 30 and was organized by OmeaLife foundation was aimed at raising awareness of breast cancer prevention among young women and commemorating Olga Gajdus, co-founder of the foundation. The route of the run led through the demanding area of the Hewelianum Centre. Event was held under the honorary patronage of rector prof. Marcin Gruchała, M.D., Ph. D.